Walking down Nanjing Lu, we tourists—and let’s face it, we’re often easy to spot—are approached every five to ten meters by women shoving designer logo-riddled pamphlets in our faces. “Bah-burry. El vee. Best quality,” they chirp. Then, “Good price for you.” For me. Right. God forbid you allow your eyes to linger on the pamphlet for too long, and you will suddenly find yourself surrounded by a crowd of women offering similar ‘designer’ goods at ‘Chip, chip’ prices. If and when you do decide to follow (after a long day of walking past store after expensive store of luxury goods that you need in order to become a certain kind of person who you want—but simply cannot afford—to be, you are led past the skin composed of these high-end retail stores and into the depths of the old fabric. Via the network of narrow alleyways—a huge contrast to the wide, open shopping street—you arrive at an unmarked, ordinary door. 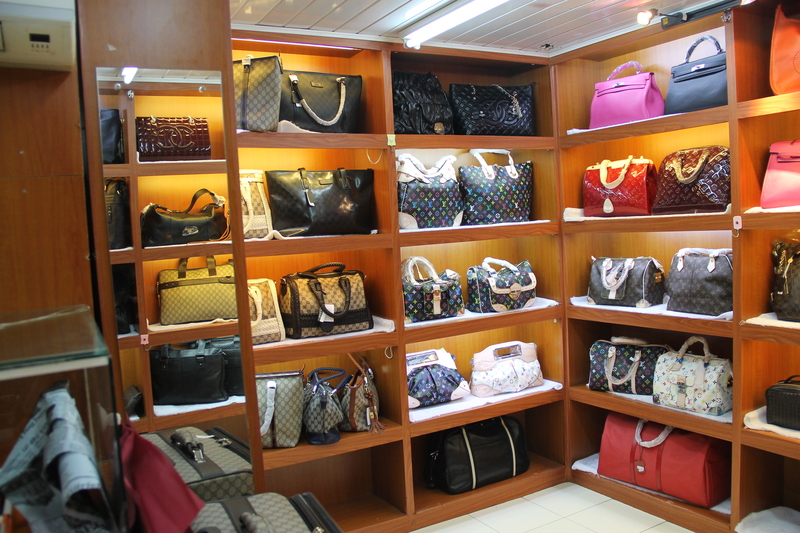 On the opposite side of the door, however, you are greeted with brightly lit shelves lined with neatly displayed handbags from every well-known designer label. A bit further, and you see Chanel sunglasses, Rolex watches, and Gucci shoes, all of which look absolutely authentic, especially to the untrained eye. The salespeople insist that their merchandise is the best available, yet the prices are completely negotiable. Finally, if you are unable to find what you want, the ‘guide’ is more than willing to lead you to the next back-alley shop. Counterfeit versions of almost anything are easy to find in China, whether one is looking for DVDs, fragrances, or outerwear. Likewise, however, shoppers in China must be wary of the fact that the goods of which they think they’re buying the genuine product, such as foreign cigarettes, car parts, and even medicine, may not only be fake as well, but can also be dangerous. And then there are the goods that fall in a ‘gray’ area—headphones, golf clubs, and computer software—where the product’s performance, not simply its exterior image, is what makes the authentic version a popular luxury item. But how has this phenomenon come to be? And, perhaps just as importantly, how has such blatant illegal activity not yet been abolished, despite many countries, especially the US, having expressed their frustration with the quantity of pirated goods that are crossing their borders via China? Although the Chinese government has established many programs meant to alleviate this problem, such as a hotline that grants monetary rewards to people who report on illegal factories, these stores are all too easy to come by. However, according to an NPR article, “experts doubt whether China can—or even wants to—enforce its own piracy laws” since the “industry of knockoffs generates income and employment for local governments” (Lim, Louisa. 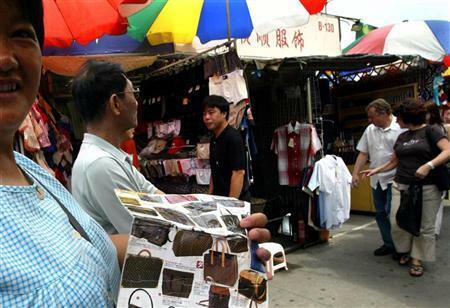 “Chinese Crackdown Fails to Stem Counterfeit Goods.” Aug. 23, 2006.). Moreover, the availability of quality lookalikes is a major tourist attraction. One could even argue that the brands being replicated have failed to intervene because they know that anyone buying a fake version of their product will eventually want to own a real one. This desire to appear a certain way—wealthy, sophisticated, stylish—is what is perpetuating this vicious cycle in China. It is hard to believe that the government is not simply turning a blind eye to the parade of easily-spotted, pamphlet-wielding women, and it is common knowledge to counterfeit sellers that, if their booths get shut down, they can simply relocate. When Shanghai’s famous Xiangyang market (in which an estimated eighty percent of the goods were fake) was closed, stallholder Huang Xiaoyu, having been protected from punishment because her stock was valued at less than 50,000 Yuan, “thought she’d probably move her stall elsewhere.” Were it not in the Chinese government’s best interest to allow this behavior, it would work harder to eliminate the counterfeit industry. Now, again, I must ask what makes this industry so lucrative that the government is willing to ignore a practice that not only upsets its friends and allies, but is also known to sustain child labor and violent crime. The answer is simple: the volume of sales that these stores produce is just too profitable to eliminate it from the Chinese economy. And why is this the case? We are so obsessed with outward appearances that we are eager to follow the lady from one store to the next, buying items we’ve always wanted as well as those which we hadn’t even realized we wanted until they were affordably in our financial grasp. Moreover, the counterfeit goods in China are, notably, perfect copies of the ‘real’ thing. Therefore, even if one could afford a real Louis Vuitton handbag, why would she invest in just one bag when she can take the same amount of money and buy an exact replica of the coveted purse plus four other expensive styles? Then again, when evaluating the legitimacy of buying imitation goods, one can’t help but take into account (and be heavily influenced by) the ‘real fakeness’ of the items; that is, if the original and counterfeit purses are made of the same materials, assembled via the same method, and look and feel exactly the same, who’s to say that the fake isn’t the ‘real’ thing? However, when it comes to image, the pattern in China proves that consumers are only interested in authenticity when it is immediately and physically visible, such as the case with wallets and sunglasses. The availability of counterfeit Beats, a line of headphones known for producing high-quality sound but at a relatively high cost, demonstrates the fact that people are purely concerned with how they appear on the exterior, since the interior mechanics of the fake product—which is what makes said product special—are nothing like the real thing. Similarly, what is the point of buying a fake iPad, when it will most likely underperform the real thing, if not to manufacture a certain image by which others will think of you? This leads to the question, what is reality. 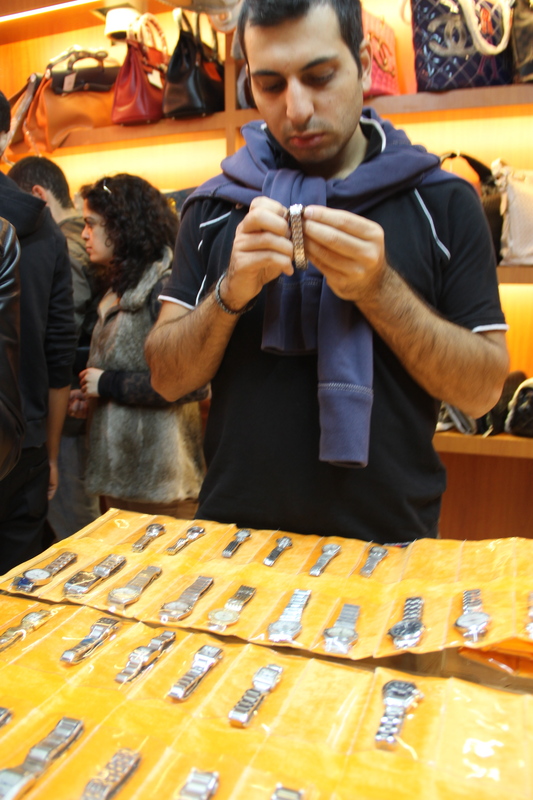 With the quality of counterfeits improving so much, sometimes even the professionals are fooled; counterfeits have made their way into legitimate stores, while an early 2000s study found that some fake Rolex watches were so well made that even Rolex employees had difficulty distinguishing them as replicas. Because of this, “not even the ‘pirates’ are immune” to being ripped off; “there are even…rip-offs of successful [fake] brands, that is fakes of fakes,” (Yi-Chieh, Jessica Lin. 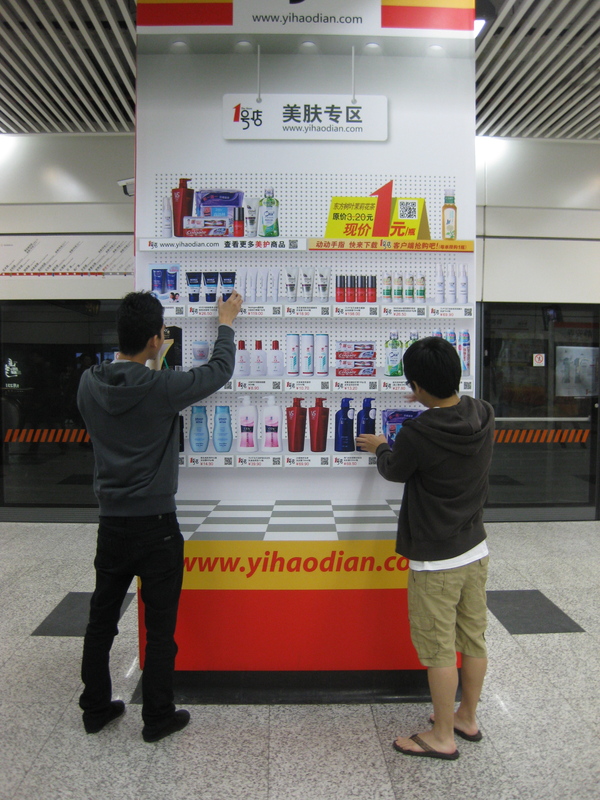 Fake stuff: China and the Rise of the Counterfeit Goods. Page 22.). Will the fakes become real? The global phenomenon, in which people attach so much value to the iconography and branding of lifestyle goods, is perpetuating a practice of “reproduction” that is infiltrating into all other aspects of culture, especially with regards to the notion of cities and urban development. By the year 2012, Korea plans on connecting every single home in the country to the Internet at one gigabit per second. Upon hearing this, the first thought that crossed my mind was how convenient it would be to stream 1080p HD quality videos on YouTube without any lag or buffering time. Its obvious, however, that the Koreans have far more important reasons for advancing their status as the “most-wired” nation in the world than for the mere sake of entertainment. We witnessed firsthand the extreme extents to which the Koreans have practiced their increasing digital prowess. They use their mobile devices to pay for public transportation, shop for clothing and other products, buy groceries, handle business, and do various pastime activities. These are all programmatic activities that at one point in time required architecture to house them. But when all these programs are conveniently compressed into a singular handheld device readily and affordably available to an entire population, the growth of the physical city slows down. Why waste space to build a physical grocery store? You can easily display pictures of food on the wall of a subway station and have customers scan bar codes of desired items with their cell phones on their way home. All you need at that point is the manpower to deliver the food. The notion of a city’s physicality is diminished, if not completely trumped, by a nation that doesn’t simply want more efficient phones or faster internet; it wants to be a city that operates digitally. Lacking the competent manpower, landmass and political authority to compete with China, Korea has decided to conquer the intangible realm of the digital world. Consequently, the need for a physical building is so drastically reduced that the city actually begins to “de-densify” its built environment. As a result, a reduction in density leads to gradual increase in open public space. pensive for anything short of lucrative malls, offices, and residential high-rises. In the case of Korea, on the other hand, it is specifically the contrasting decrease in built density, resulting from a trend towards digital development, that actually leads to a reintroduction of open public spaces and landscaping. Intentions reach far beyond sheer leisure for the public. The recently finished, Seonyudo Park epitomizes this current trend of de-densification. It is an award-winning landscape project built on an island formerly utilized as a sewage plant. Its creation represents the nation’s strong willed trend toward providing more parks and public spaces for its people. 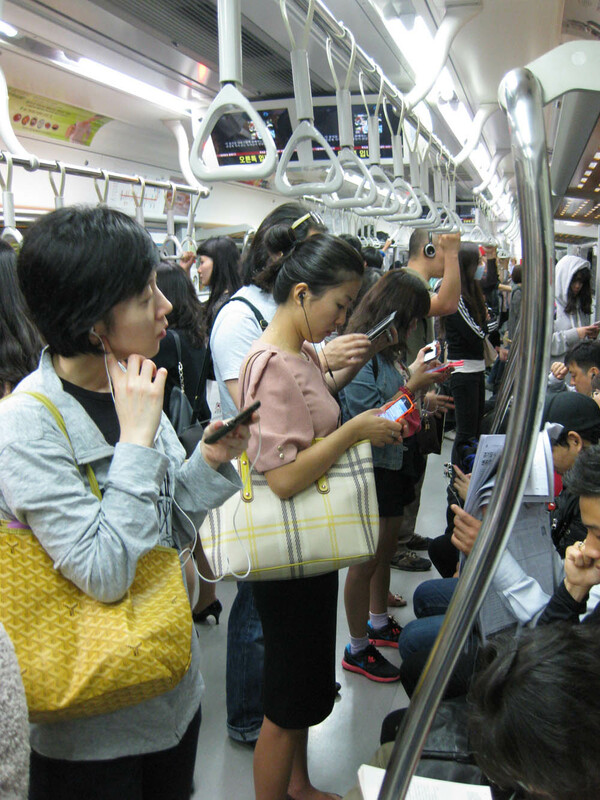 It’s ironic how digital advancements in Korea can actually lead to a possible increase in social life. It’s a situation in which a country has become so developed in their digital prowess that they are actually stepping backward by building less buildings and implementing more green.